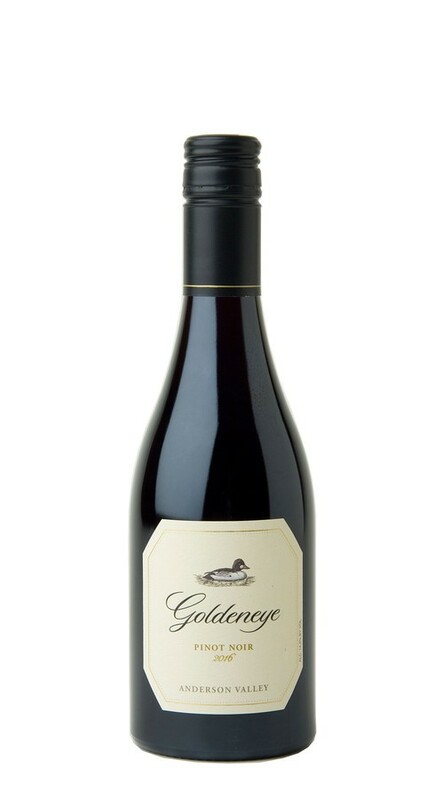 In 1996, building on the tradition of excellence they established at Duckhorn Vineyards, Dan and Margaret Duckhorn embraced their growing love of Pinot Noir and came to Anderson Valley to found Goldeneye. In the years since, Anderson Valley has earned acclaim as one of the world's greatest regions for Pinot Noir. Crafted predominantly from our estate vineyards and shaped by the influence of the wind, water and fog, this wine embodies both the elegance of Anderson Valley Pinot Noir, and its deep, rustic beauty. Combining the lush fruit of our warmer estate vineyards with the rustic elegance of grapes from the cooler “deep end” of the valley, this wine offers a beautifully complete expression of Anderson Valley Pinot Noir. On the palate, lively flavors of wild strawberry and cherry are in perfect harmony, with terroir-driven hints of saddle leather, anise, pennyroyal and wild mushrooms, as well as notes of confectionary spices and vanilla from aging in the finest French oak.